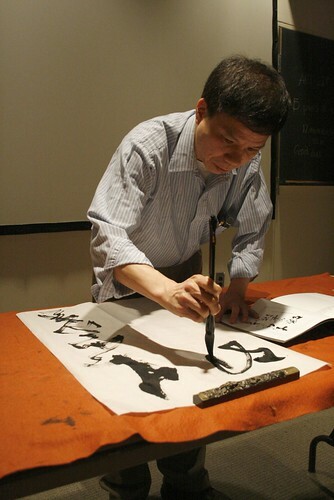 I attended a lecture at Wellesley College on Tuesday night by Chinese Calligrapher Mike Mei. My mother has studied Chinese calligraphy with him, so I know him through her and invited him to do a lecture and demonstration at Wellesley. I’ve had a long term interest in Chinese calligraphy because I think there are many strong correlations between Chinese calligraphy and drawing that are surprisingly similar despite how different they can seem at times. The lecture was great to attend, as it filled in a lot of blanks for me about how Chinese calligraphy works. Mike’s lecture centered around comparisons between ancient traditions of Chinese calligraphy and the innovations he has made himself based on these traditions as a contemporary calligrapher. He explained that there are 5 generations of Chinese calligraphy, each with its own distinct look and set of (or lack of) rules. For example, in the first generation of Chinese calligraphy, the characters all fit perfectly within a verticle rectangle and are comprised of strokes which lack emotion due to the consistency of each stroke. 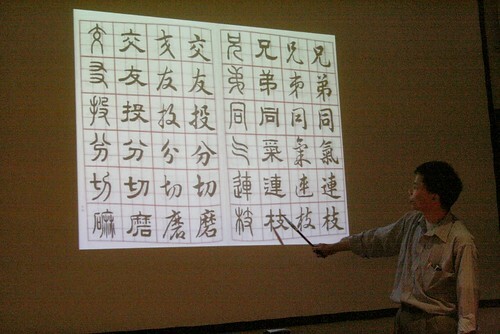 Mike Mei shows a slide which demonstrates 4 styles of Chinese calligraphy for each character. The generation that he discussed which I was most fascinated by was the 5th generation, or the cursive style of Chinese calligraphy. In the cursive style, one continuous brush stroke is applied to write either a many stroke character or to even write many characters all at once. He explained that many people see Chinese calligraphy as Chinese abstraction: the cursive style is so free and extreme that the majority of the time the characters become completely illegible, even to someone who reads Chinese fluently. This was such an interesting idea to me- the entire purpose of characters is to communicate language, and yet here is an art form which denies you that ability. After the lecture, I requested to Mike to do a demonstration of the cursive style, and I was astounded by the extraordinary balance of complete, uninhibited spontaneity and absolute control and focus. Watching his brush move across the page, every kind of rhythm was there: soft, slow, fast, bold, etc. Mike Mei demonstrates the cursive style of Chinese calligraphy; he uses 2 continuous brush strokes to write 10 characters. Some concepts he discussed which I found really interesting was about the rhythms that happen during the act of writing: the brush moves slow, then fast, and then becomes dramatically heavy. I asked him about what kind of preparations he does to create a piece, and he talked about creating a feeling of strength within yourself and investing in a specific feeling or emotion. Both of these concepts have their correlations in drawing; the idea of rhythm can be see in terms of gesture and making marks while having a strong and confident mindset is essential to creating an effective drawing. Clara, That’s great! One lecture can make you have so much harvest & thought. Clara, I enjoyed reading your blog about Mike Mei’s calligraphy lecture at Wellesley. I have seen his work around Chinatown. In my childhood I studied a bit of calligraphy and both his work and your description of the lecture inspires me to study more. Thank you for arranging for Mike Mei’s demonstration of calligraphy, and for writing about his work. I am one of Mr. Mei’s students. It is a rare opportunity to learn from a great teacher, especially from one who is a master of the earlier forms of Chinese calligraphy (e.g., “seal script” and “clerical script”) as well as the later generation styles. Your support for the Wellesley event helped to share Mr. Mei’s knowledge with others.